This post has been sitting in my inbox since January 1st, of 2016. 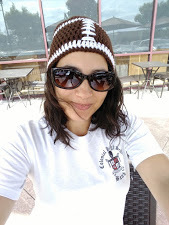 Sad that the only thing I needed was to add shop links, and a photo, but I’ll tell you what held me back the whole time… Weaving in the ends! Three years later, and I still hadn’t weaved them in. Holy cow. This is why I weave in as I go now because of situations like this. Back then: I am in love with the combination of pinks and cream here, and how the edging turned out! It gives me a vintage feel. This blanket would be a great baby shower gift, or as part of your nursery. The size makes it great for changing baby’s diaper, tummy time and cuddling. It’s also longer than my I Love This Soft Baby Ripple Blanket so it’ll work great for toddlers and children also. I put it on the legs to see, and it covered them comfortably with my feet left hanging out. 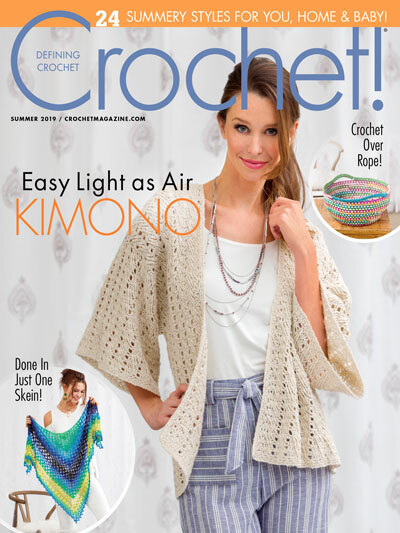 Now, I think I want one to use when I am sitting up in bed crocheting! 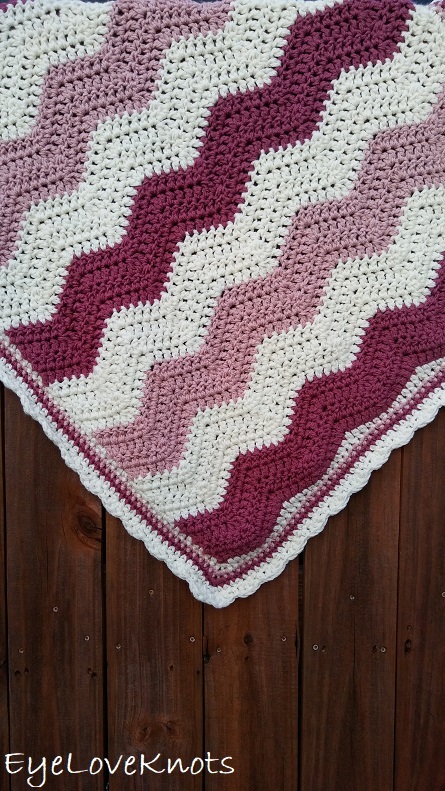 Shop EyeLoveKnots Etsy: Raspberries & Cream Ripple Baby Blanket. 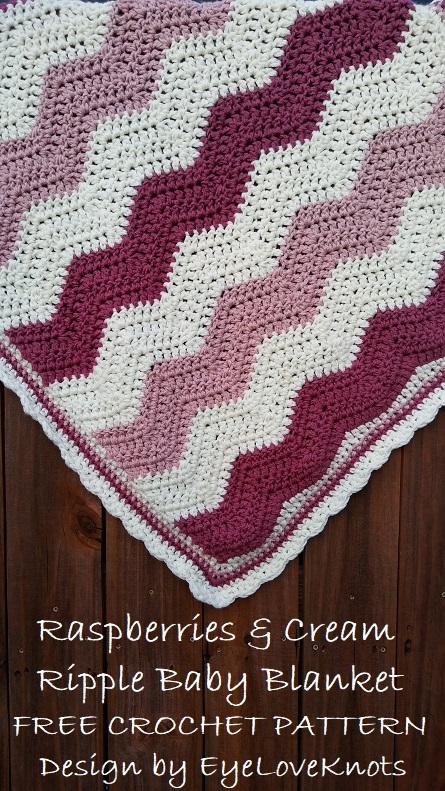 Shop EyeLoveKnots LoveCrochet: Raspberries & Cream Ripple Baby Blanket. Are you a Raveler? 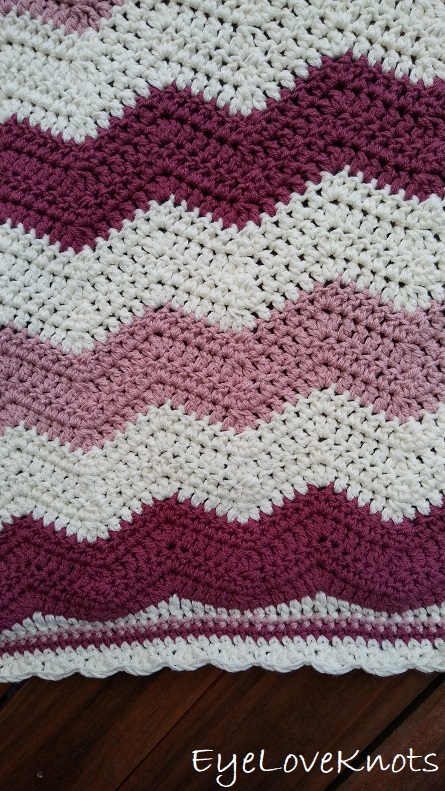 Share your version of this project on Ravelry – Raspberries & Cream Ripple Baby Blanket. Chunky/Bulky yarn will also work since this blanket is made using two strands held together. You may opt to purchase two skeins of the same color and hold the strands both from the center pull, but I did it the hard way and held the strands from either end of the skein. I worked up this blanket in just over 5.5 hours, including the weaving of my ends. To work a dc3tog: Yarn over, insert hook into the first stitch, yarn over, pull through (3 loops on hook), yarn over, pull through two loops on hook, yarn over, insert hook into next stitch, yarn over, pull through (4 loops on hook), yarn over, pull through two loops on hook, insert hook into next stitch, yarn over, pull through (5 loops on hook), yarn over, pull through two loops on hook, yarn over, pull through all 4 loops on the hook. Use two strands held together. As mentioned above – I held the strands from both ends of the skein – shown to the right. To make it easier on yourself, you can unwind the skein and rewind with both strands together. I don’t do this, but it would definitely help with the tangling. Ripple Pattern can be made bigger or smaller by adding or subtracting 12 chains. Blanket can be made longer or shorter by adding or subtracting 2 rows – two rows together measures 1.75″ in length. I suggest leaving the color changes on even rows, as I have, otherwise the sides of your blanket will have a funny little visible yarn change thing going on – I learned this the hard way on another project I worked. It’s not real obvious, but was obvious enough for me not to try it again. R2 – 4: Chain 2, turn. DC in the 1st DC and the next 4 DC’s, (dc3tog, DC in the next 4 DC’s, 3 DC in the next DC, DC in the next 4 DC’s) 4 times, dc3tog, DC in the next 4 DC’s, 2 DC in the last DC. Change to Ivory. R5 – 8: In Ivory, Chain 2 and turn. DC in the 1st DC and the next 4 DC’s, (dc3tog, DC in the next 4 DC’s, 3 DC in the next DC, DC in the next 4 DC’s) 4 times, dc3tog, DC in the next 4 DC’s, 2 DC in the last DC. Change to Rosy Cheeks. R9 – 12: In Rosy Cheeks, Chain 2 and turn. DC in the 1st DC and the next 4 DC’s, (dc3tog, DC in the next 4 DC’s, 3 DC in the next DC, DC in the next 4 DC’s) 4 times, dc3tog, DC in the next 4 DC’s, 2 DC in the last DC. Change to Ivory. R13 – 16: In Ivory, Chain 2 and turn. DC in the 1st DC and the next 4 DC’s, (dc3tog, DC in the next 4 DC’s, 3 DC in the next DC, DC in the next 4 DC’s) 4 times, dc3tog, DC in the next 4 DC’s, 2 DC in the last DC. Change to Raspberry. R17 – 20: In Raspberry, Chain 2 and turn. DC in the 1st DC and the next 4 DC’s, (dc3tog, DC in the next 4 DC’s, 3 DC in the next DC, DC in the next 4 DC’s) 4 times, dc3tog, DC in the next 4 DC’s, 2 DC in the last DC. Change to Ivory. R21 – 24: In Ivory, Chain 2 and turn. DC in the 1st DC and the next 4 DC’s, (dc3tog, DC in the next 4 DC’s, 3 DC in the next DC, DC in the next 4 DC’s) 4 times, dc3tog, DC in the next 4 DC’s, 2 DC in the last DC. Change to Rosy Cheeks. R25 – 28: In Rosy Cheeks, Chain 2 and turn. DC in the 1st DC and the next 4 DC’s, (dc3tog, DC in the next 4 DC’s, 3 DC in the next DC, DC in the next 4 DC’s) 4 times, dc3tog, DC in the next 4 DC’s, 2 DC in the last DC. Change to Ivory. R29 – 32: In Ivory, Chain 2 and turn. DC in the 1st DC and the next 4 DC’s, (dc3tog, DC in the next 4 DC’s, 3 DC in the next DC, DC in the next 4 DC’s) 4 times, dc3tog, DC in the next 4 DC’s, 2 DC in the last DC. Change to Raspberry. R33 – 36: In Raspberry, Chain 2 and turn. DC in the 1st DC and the next 4 DC’s, (dc3tog, DC in the next 4 DC’s, 3 DC in the next DC, DC in the next 4 DC’s) 4 times, dc3tog, DC in the next 4 DC’s, 2 DC in the last DC. Change to Ivory for Border. **At this point, I paused on the corner to weave in the ends on this side. Blanket looks great here! But I wanted a little frilly edge so I added a subtle shell edging. I really like the look of larger shells on chunky items, but choose not to this go ’round. Should you desire larger shells, work in the sequence of SC in the 1st/next SC, skip the next 2 SCs, 5 DC in the next SC, skip the next 2 SCs… You’ll end up with 73 shells. Please feel free to make and sell your own Ripple Blanket using this pattern, but please DO NOT claim this pattern as your own nor should you sell my pattern, and DO NOT re-publish my photos as your own. DO NOT copy and paste my pattern anywhere, link to it instead. I love the colors you used. I’ve made several blankets using a similar pattern, but I always used yarn scraps and they never looked so pretty. 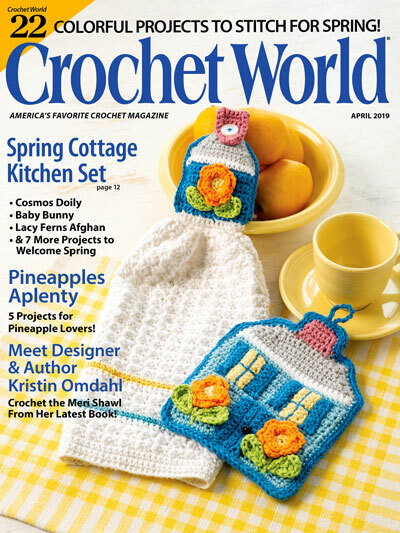 I don’t do well with scraps – I need a set pattern to follow. I think the scrap ones turn out beautifully though! This is beautiful. My grand daughter has a afghan that her great grand mother made her, and it is falling apart. I will have to try and make her one like this! Wish me luck!! !